"I am soooo happy that I did it!" said first-grader Cameron Gooden when his mother asked him what he thought of the Nationwide Braille Readers Are Leaders Contest. "It was so much fun!" Cameron was the first-place winner in the K-1 grade category, and his parents and teachers were thrilled by his achievement. "We were very surprised to learn that he took first place," his mother wrote. "His school is also very proud. The principal included a statement about Cameron winning the competition in the daily announcements, and they are honoring him at the next school board meeting. Since the competition his Braille reading has become more fluent." For twenty-nine years the National Organization of Parents of Blind Children (NOPBC) and the National Federation of the Blind (NFB) hosted Braille Readers Are Leaders (BRAL), a national competition for K-12 students who read Braille. After the BRAL contest was discontinued, the NFB of Illinois decided to sponsor a statewide contest in 2013. Response to the Braille Readers Are Leaders of Illinois contest was so positive that Illinois teamed with Minnesota in 2015-2016 to offer BRAL LOL2 (for Land o' Lincoln and Land o' Lakes). The 2016-2017 competition included all of the Great Lakes states: Minnesota, Wisconsin, Michigan, Illinois, Indiana, Ohio, Pennsylvania, and New York. In the fall of 2017 the NFB of Illinois, in conjunction with the National Association to Promote the Use of Braille (NAPUB), extended the opportunity to NFB affiliates throughout the United States. Each affiliate that chose to participate in the Nationwide Braille Readers Are Leaders contest contributed one hundred dollars to cover prizes, postage, and other expenses. Sixteen states chose to take part, and eighty-one students from twelve of the participating states actually submitted reading logs at the close of the contest period. In order to take part in the contest, students counted the number of Braille pages they read between December 15, 2017, and February 1, 2018. 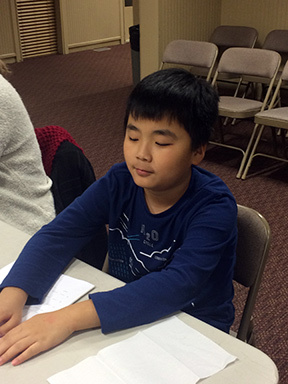 Students competed within five grade categories: K-1, 2-3, 4-5, 6-8, and 9-12. The top three students in each grade category won cash prizes. In some cases an honorable mention was also awarded. The first-place winner in each category received $25. The second-place prize was $15, and the third-place and honorable mention recipients won $10. In addition to the prizes based on the number of pages read, several participants received Kelly Doty Awards of $25. The awards were given in memory of Kelly Doty, a longtime member of the NFB of Illinois who was a dedicated promoter of Braille. The Kelly Doty Awards were given to students who faced special challenges in order to become proficient Braille readers. Such challenges included, but were not limited to, having disabilities in addition to blindness or being an English-language learner. When the reading logs began to come in, we received many wonderful letters from parents, teachers, and students themselves. "As a parent [I believe] reading for the simple joy of it is power," wrote Alison Tarver, whose son, Nicholas Tarver, was the second-place winner in the grades 6-8 category. "Having opportunities to promote reading with rewarding contests is a wonderful way to motivate children to connect and fall in love with reading!" She went on to explain, "Before this contest Nicholas would read mysteries and comedies. When he started reading for this contest I challenged him to read other types of books, and he discovered that he really enjoyed reading nonfiction. What a remarkable discovery! I think he read at least twelve nonfiction books for this contest." Rachel Bodek told us, "Even though my son didn't win a prize, the contest really motivated him to do more Braille reading. We'll try again next year." Through our email exchanges with parents and teachers, we learned the stories of many of the contest participants. Thirteen-year-old Holly Connor of St. Louis is intensely involved in community theater. When she has down time backstage, she keeps busy by reading novels on her electronic Braille device. Soon after his family emigrated from Ecuador, Alan Bunay unexpectedly lost most of his sight. Undaunted, he set about to learn English and Braille. 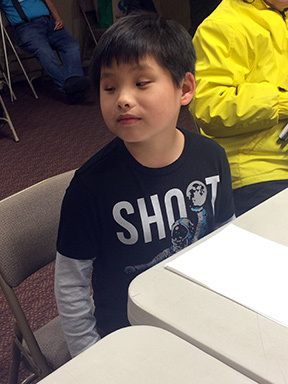 Jonah and Isaiah Rao also face the challenge of learning both Braille and the English language. The boys were adopted from China in August 2017. "Both boys have embraced this huge change in their lives and really are doing super!" wrote their mother, Monica Rao. "We are blessed to have them as our sons!" The top reader in the entire contest was Maria-Luisa Monteiro-Oliveira, a ninth grader who read a whopping 10,297 Braille pages! We learned that Maria-Luisa's mother began reading to her when she was a baby, and Maria-Luisa developed a consuming love of reading. When she entered school her teacher of the visually impaired transcribed an average of four books a week into Braille to keep up with her reading needs. "Luisa enjoys getting lost in the worlds she explores in the books she reads," wrote her TVI, Jackie Mushington-Anderson. "As she got older, it became necessary to teach her how to download her own books. We just could not keep up with her demands. She currently uses her Braille Sense U2 to access Bookshare. However, she still prefers hardcopy Braille." Among the titles that Maria-Luisa read for the Nationwide BRAL contest were Gone with the Wind by Margaret Mitchell and Les Miserables by Victor Hugo. When she received her check for first prize she wrote, "Thank you very much. I really did not do anything differently. It is great to get money for something I do anyways." Not every student could win a monetary prize, but each student who submitted a reading log received a package of small gifts related to Braille. These included Braille slates and styluses, Braille calendars, Braille playing cards or tactile Tic-Tac-Toe sets, and adhesive dots for labeling items at school and around the house. We extend our warmest thanks to National Braille Press and Seedlings Braille Books for Children. Both organizations donated gift certificates that the students could use toward the purchase of their own Braille books. Packing and mailing eighty-one padded envelopes filled with gifts was an impressive task, but Illinois Federationists Bob Gardner, Lois Montgomery, and Pat Olson rose to the occasion. Their dedication to this project embodied the love, hope, and determination that are hallmarks of our NFB philosophy. Nationwide BRAL brought out a spirit of competition in most of the students who took part. For some it also fostered a sense of solidarity with other Braille readers across the country. Nicholas Tarver expressed this idea when he wrote, "It is so cool that kids from all those states were reading along with me. I wonder what they were reading and how many pages they read." Below is a list of all of the 2018 Nationwide Braille Readers Are Leaders winners. Congratulations to every one of them!